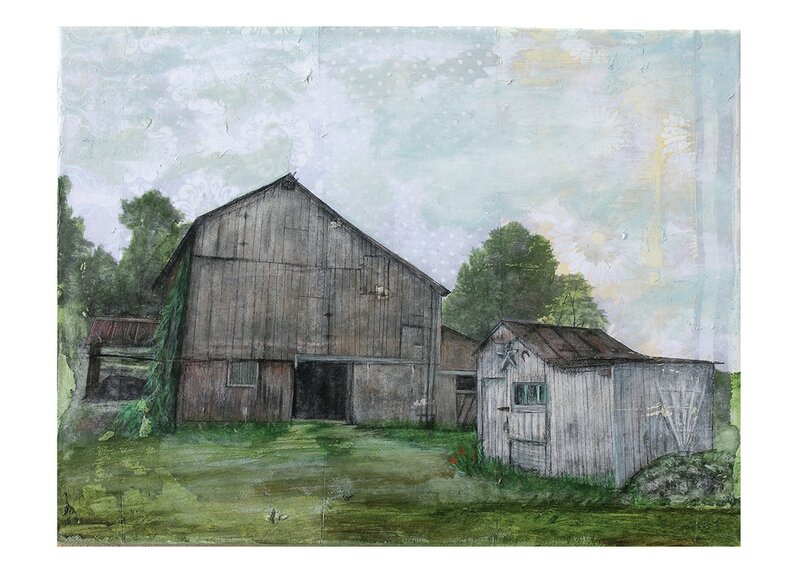 ​I regularly use my farm and rural surroundings as subject matter for my artwork. I am interested in the natural beauty of this scenic area. The image of “The Lake” is a photograph I took at our family camp on the Kinzua Reservoir. I transferred the image onto canvas and then worked back into it with paint. I tried to capture the feeling of summer to enjoy all year long. “The View” is an image of my in-law’s barn and pump house. This is the view from their house that has been in the family for three generations. This image is a black and white photo transfer on pieced fabric. I then used paint, colored pencil, and markers to add in color and detail. I believe that we look at the same surroundings all day long and sometimes we take for granted how beautiful our surroundings really are. ​Nicole Shields is an artist, a mother of two, and a teacher. Nicole lives and works in Randolph, New York. She graduated from SUNY Oswego in 2004, with a B.F.A. and a Master’s Degree in Art Education. She has been an Art educator at Cassadaga Valley Jr. /Sr. High School for the past thirteen years. In addition to teaching full time, Nicole and her husband, Seth, operate a small farm. Nicole spends much of her day working with her children’s 4-H animals and gardening. Nicole’s artwork is inspired by her rural surroundings and agrarian lifestyle. She enjoys creating artwork based on her farm. Her work includes painting and photography mixed media pieces on fabric/ recycled farm materials. She starts her paintings by sewing fabric together. Then she adds photographs, paint and colored pencil. Currently, she is using materials such as feedbags, burlap, and fabric as backgrounds for her work. Nicole has displayed multiple works at the annual Chautauqua County Art Teachers Exhibition, Prendergast Library, Jamestown, New York.